Gabriel is my own poky little puppy. I’m talking about the head-in-the-clouds, procrastinating, slow-moving, can’t-walk-in-a-straight-line-distracted kind of poky. This verse is so affirming to me in my vocation. A young mom like myself needs patience in abundance in the most ordinary of tasks she must complete with young children in tow. Even getting out of the van and into the house is a challenge every single time, since I can’t physically carry Gabriel in now (I have to carry Faith, the diaper bag, etc.) and I have to steer his poky little self through my front door. On a side note: I kind of wish I could press a button and have my front door slide open for me, like my wonderful Honda Odyssey, instead of what I currently have to do, which is prop open the heavy glass outer door which doesn’t stay open by itself anymore and fish out my keys to manually unlock the heavy inner door that sticks to the door frame a little and requires about half my body weight of force to open. Anyway, as much as I want to whine and complain about my daily struggles with patience with my poky little Gabriel, God has been reminding me this week that I’m one of His particularly poky kids. He sure puts up with some goofiness where I’m concerned! So many mornings I drag my feet to just get out of bed to say a short morning offering (not to mention my lofty ambitions to fold a load of laundry, make Michael’s lunch, and throw together a hot breakfast for my family!). And later in the day, how many times do I procrastinate about saying a 5-minute chaplet, when I often spend more time getting dressed, throwing some makeup on and doing my hair for the day than I do in my morning offering and prayer? 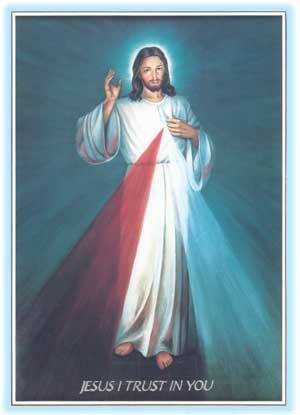 Divine Mercy Sunday was this past Sunday. I was asked to give a talk to the middle school youth group at our church on Sunday night, and ever since my talk, God has been gently reminding me to practice what I preached!